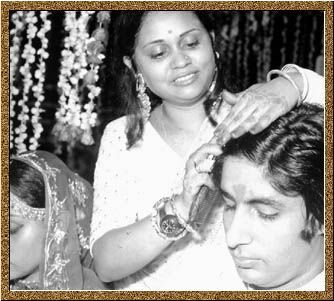 While son Abhishek Bachchan's wedding is held on such a big scale, Amitabh Bachchan's own wedding to Jaya Bhaduri, way back in 1973, was more low-key. 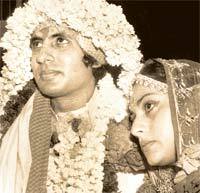 Megastar Amitabh Bachchan went into reminiscent mode to recall the time and the situation which led to his marriage to actress Jaya Bhaduri. 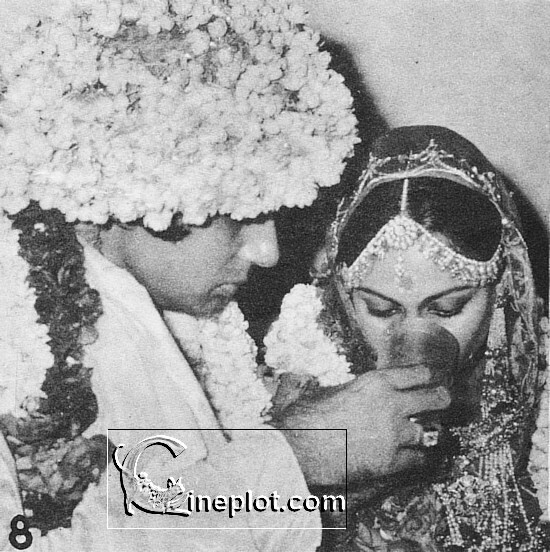 The actor blogged about the quick wedding ceremony held on June 3, 1973 so that he could leave for a holiday with Jaya to celebrate the success of his film 'Zanjeer'. 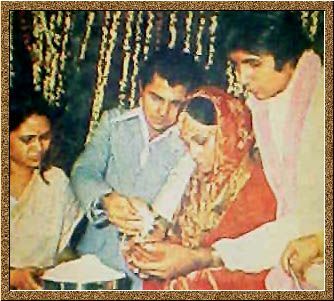 'Zanjeer' had just released. 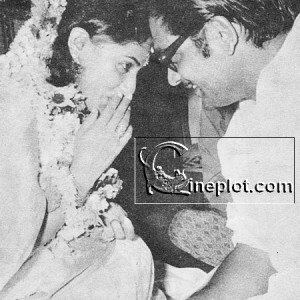 And Jaya and I and a few dear friends had decided that if the film did well we would all go to London for a holiday... 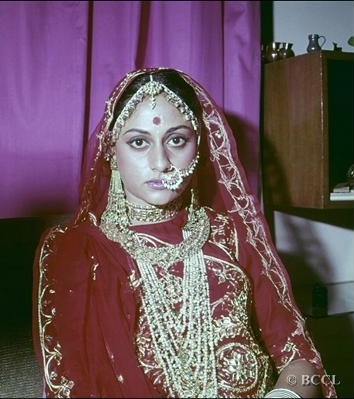 So I told my parents, who I had now invited to come and live with me, as is the culture in our land, about our decision. And my Father came down heavily on me. 'If you are planning a holiday with this girl, you will have to marry her and go, else your decision is denied!' "I was an obedient child! 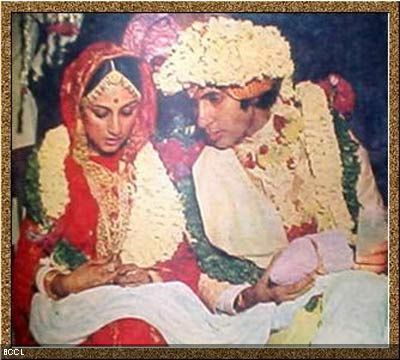 I got married the very next day in a quickly organized wedding with family and some dear friends, without any fanfare, and left for the holiday that very night," Bachchan wrote in his blog. 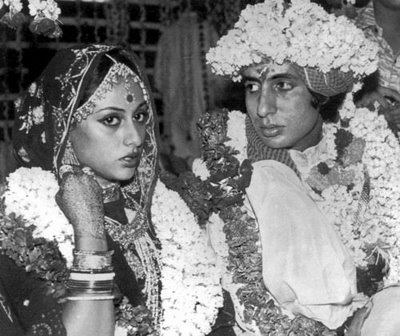 Big B said they had a simple Bengali style wedding as there was no time for a pompous celebration. 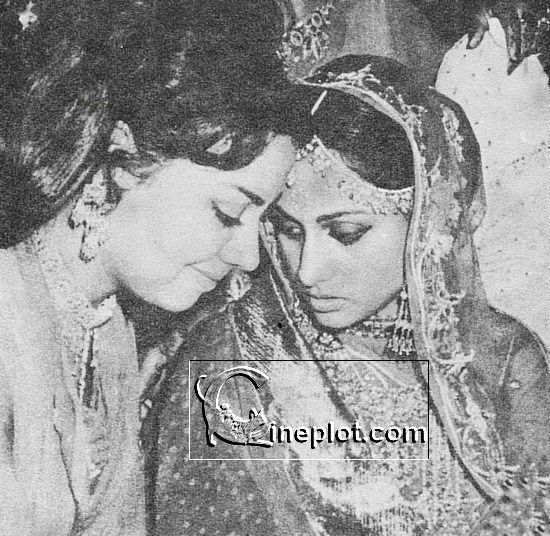 "Marriages and weddings entail great amount of ritual and protocol and decorum and priests and pundits and maulvis. They last for days with great fanfare. 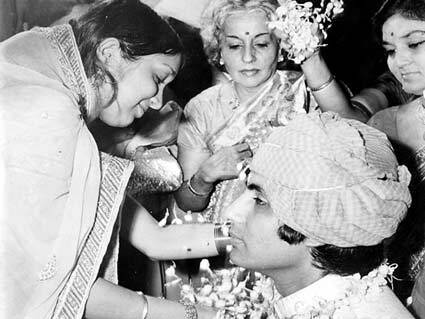 Ours was a simple Bengali pundit wedding, exchange of flowered garlands, the mangal sutra, the sindoor and it was all over before the women from Jaya's side could stop their finger in mouth screams of 'odododooooo'... or words to that effect," he added. 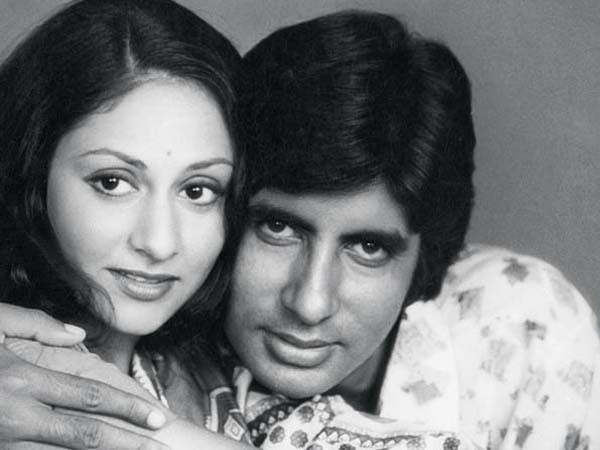 Amitabh's two films, Namak Haram and Saudagar were both quite successful when they were released in February and March 1973, and his performance in them brought widespread praise. 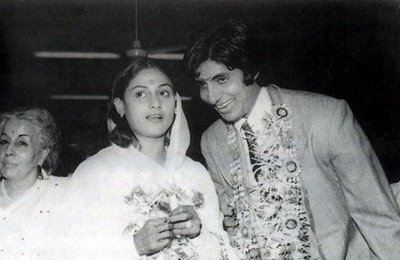 By the third week of May, Zanjeer had been proclaimed his first hit, and a week later, Amitabh gave us the news that he and Jaya were to marry. 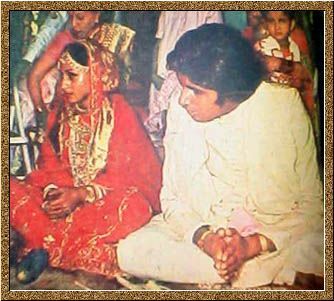 The wedding, long foreseen, was set for June 3, 1973 and was to be kept secret, because with Amitabh's rising popularity, the crowds of admirers gathering round the house had been growing every day. 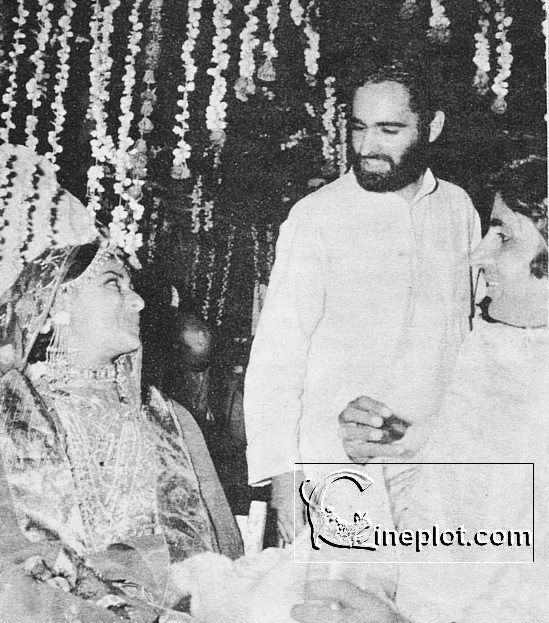 The only guests to be invited from our side were the Rajans and the Gandhis. 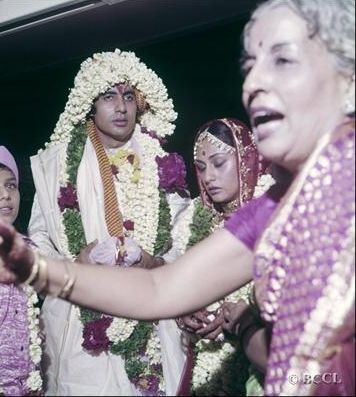 Jaya's family decided not to hold the ceremony at their flat in Beach House but at a friend's place on the top floor of the Skylark building in Malabar Hills, where it could pass off unnoticed. We sent a telegram to Jagdish Rajan to 'come with your family immediately,' with no indication of the reason. 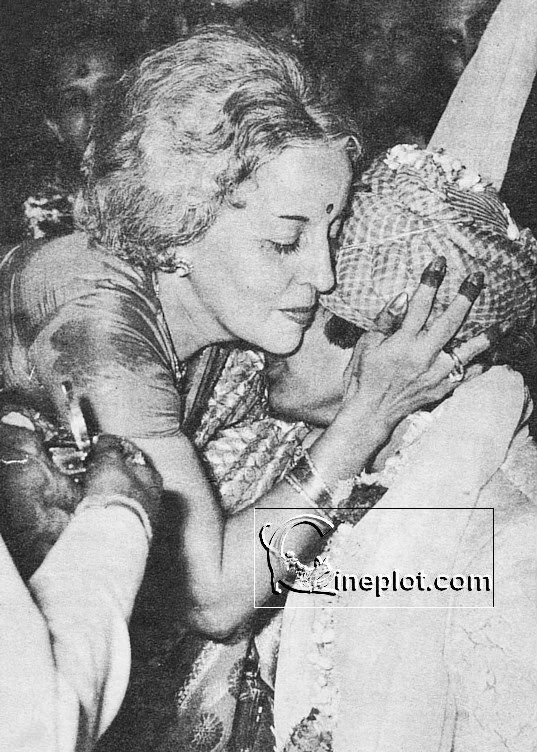 Teji invited Mrs Gandhi by telephone: as was expected, she sent her felicitations but could not come herself (just as well -- her coming would have been the end of the secrecy); Sanjay would represent the family. 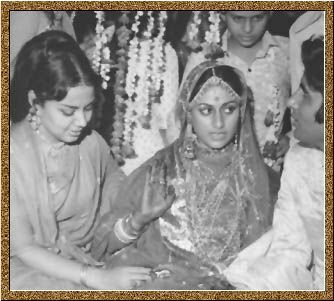 Jaya's parents wanted the marriage to be conducted in the Bengali manner, to which we had no objection. 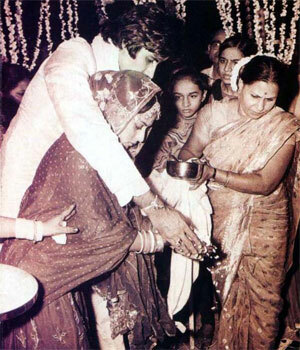 The first stage was the var-puja, the veneration of the groom, which involved Jaya's father coming to Mangal (Amitabh's residence) with gifts and conducting a small ceremony; I then reciprocated by doing the same for the bride at Beach House. 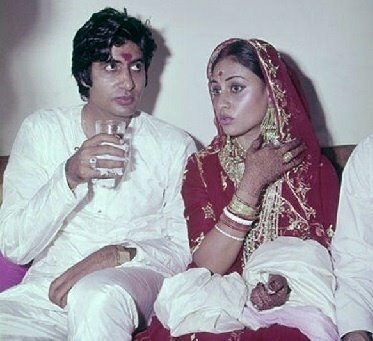 I noticed something quite unexpected at Beach House: nobody in the family, apart from Jaya, showed even the slightest trace of pleasure. 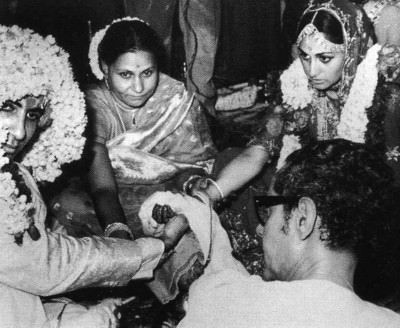 The barat was to consist of the groom himself and the three of us, the five Rajans and a party of five baratis: Sanjay Gandhi, Bhagvati Charan Verma, Narendra Sharma, Krishna Kishor Srivastava and Dr Dharmvir Bharati. 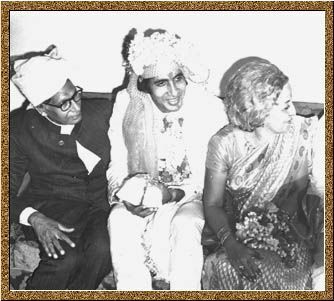 That evening, Teji and Jagdish Rajan's wife Indira anointed Amitabh with a turmeric preparation in a ceremony that would normally be accompanied by much singing and festive tumult, but here had to be done in a hushed quiet. The joy that was so confined by this constriction spilled out in a tingling of the spine and a tearful glimmering of the eye, especially in Teji's case. 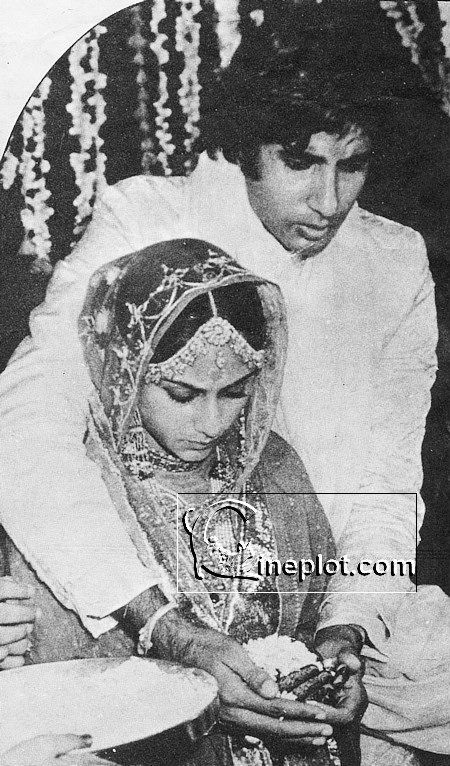 Amit looked so splendid that his mother prayed to Hanuman to protect him from the evil eye. Before fixing the bridgroom's veil of flowers, I said, my voice thick with emotion, that anyone wanting to see his face should have a good look now. Then it was time to go out to the three cars that were standing at the ready. When the neighbours asked what the long decorative strings of light bulbs signified, we explained that Amitabh would be shooting a film here the next night. 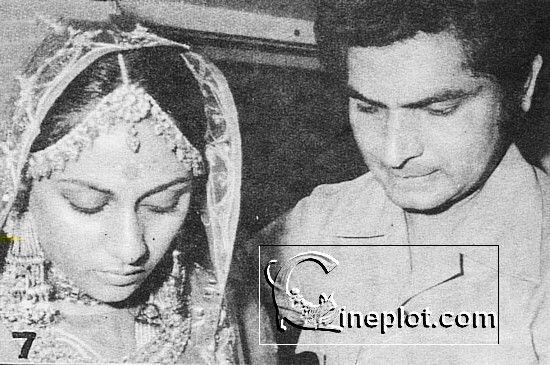 Nobody had an inkling that a wedding was under way, and the three cars driving off were assumed to be part of the film rehearsals. The barat was welcomed without fanfare in front of the Skylark building; a few people gathered to watch, but there were no crowds. 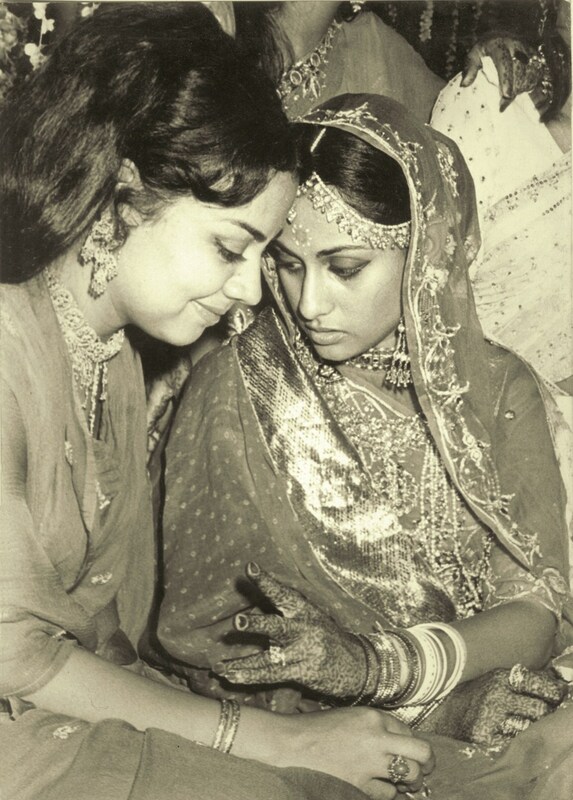 We went up in the lift, Jaya was in her bridal adornment, and for the first time, I saw a bashful shyness on her face and realised what a particular aspect of beauty it is. 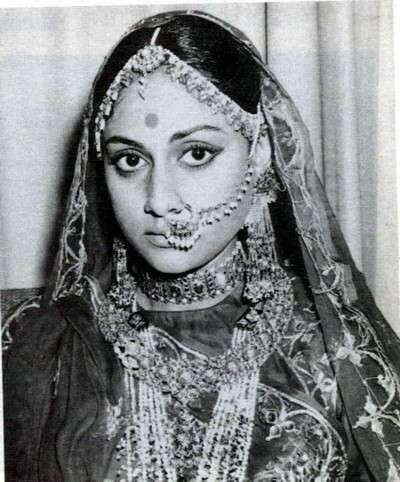 She was enough of an actress to be able to simulate shyness, but what I saw now was very natural and real. 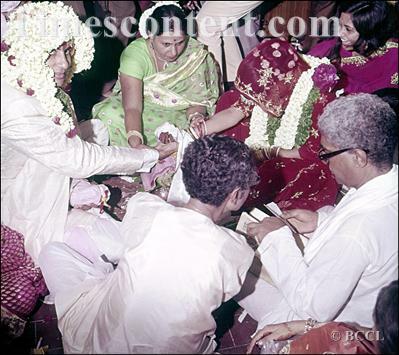 A Bengali pandit conducted the marriage, whose ceremonial went on late into the night. The five baratis had dinner and set off home, leaving just the family members to eat alone later when the proceedings were completed. Then we too took our leave. 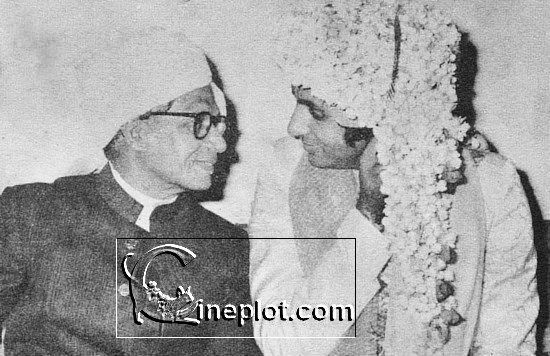 Before we left, I embraced the father of my new daughter-in-law and congratulated him on getting a son-in-law like Amit, expecting him to say the same in respect of Jaya.